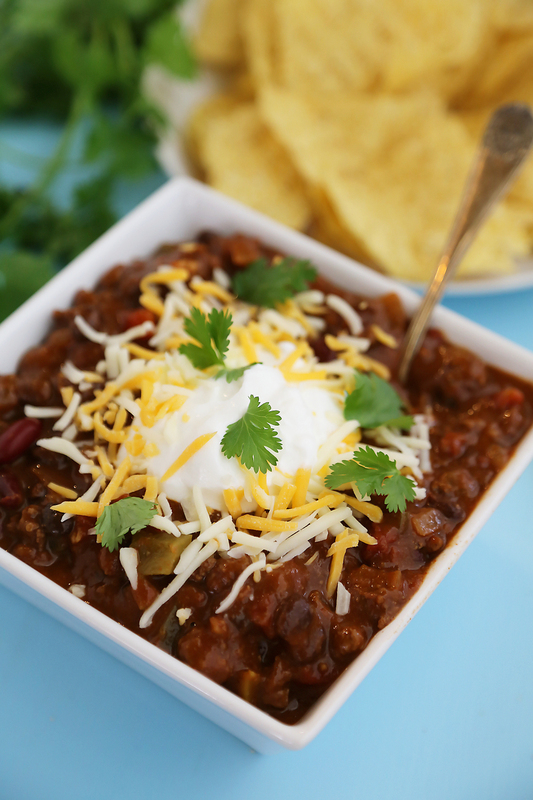 This zesty, hearty chili makes a mouthwatering bowl of goodness for weeknight meals, game days, and anytime in between. Easily made in your slow cooker, for a warm meal to come home to! I’m often asked what my favorite dish is to cook, and for the last decade, the answer has been the same. A good, spicy chili! The zesty aromas and the belly-hugging warmth of every spoonful are so intoxicating to me, and I enjoy cooking different variations of my favorite dish year round. It always brings a crowd, too! Whenever I’m sizzling up a big batch of chili, friends inevitably begin to gather. And there is nothing I like better than eating, drinking and socializing with fellow foodies! Over the years, some of my favorites have included this turkey chili, chicken chili, and of course, a hearty vegetarian chili with Parmesan polenta cakes. Yum! 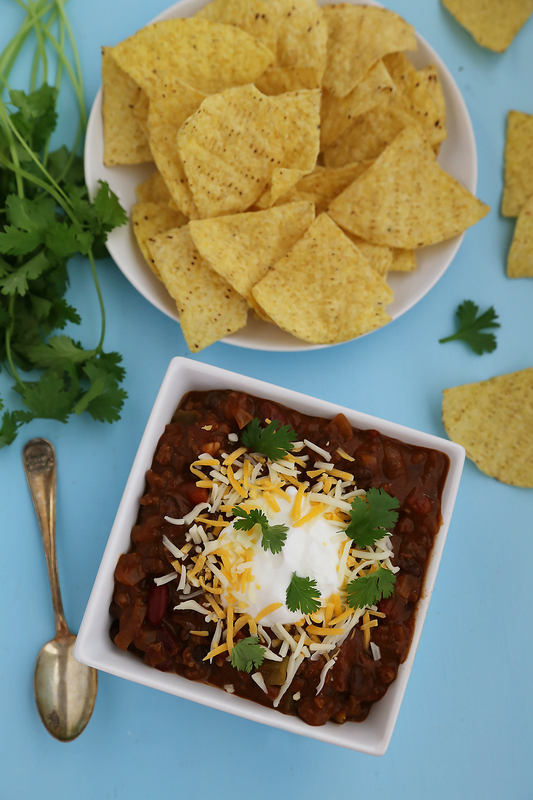 But, the chili that really has my spice-lovin’ heart is the one it all started with: This incredible, savory beef and bean variation with heaps of tomatoes, dried spices, and fresh cilantro. So simple, so scrumptious, and such a crowd pleaser! Not only has the recipe remained the same all these years, but the spices have, too! 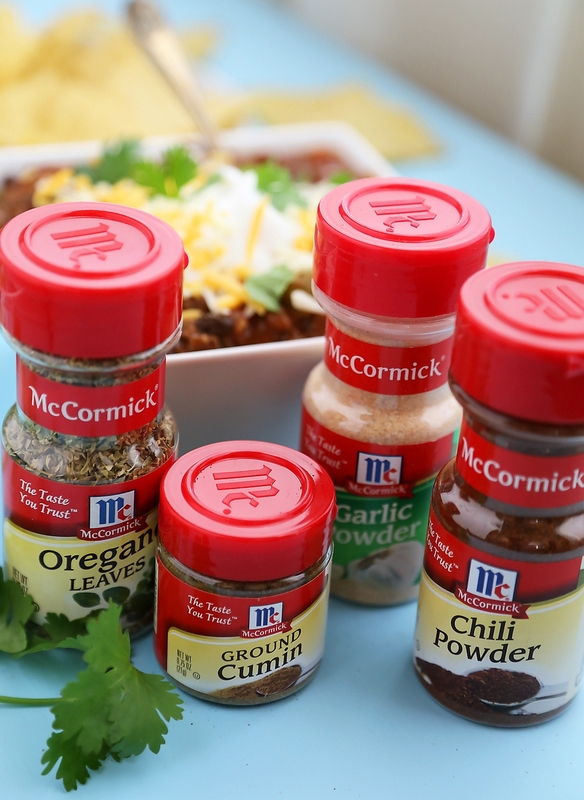 I swear by the quality and versatility of McCormick products, and always reach for them when I’m making a dish that relies heavily on dried spices and seasonings, like this chili. 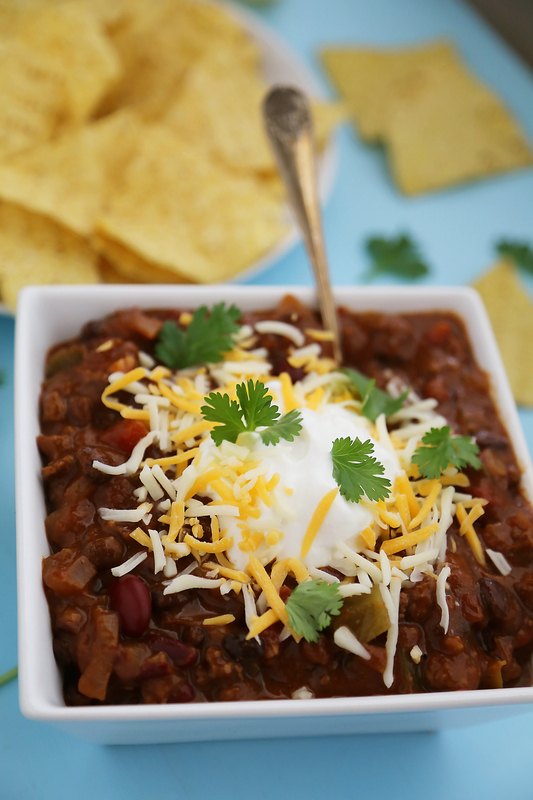 The spices I used in this chili, including chili powder, garlic powder, ground cumin and oregano leaves, marry beautifully together in this scrumptious, slow cooked favorite. The aroma intensifies as it chugs away, and is just incredible! This chili has inspired so many wonderful memories for me, especially in helping me learn which spices pair best together from my early cooking days. It has even gotten some friends who are shy in the kitchen to roll up their sleeves! While it does involve some chopping prep, the actual cooking of this chili is totally hands-free. Good news for busy moms and working professionals! Just toss the ingredients in your slow cooker and set it to sizzle for the day. Once it’s done, spoon yourself a big bowl, or make it an occasion to enjoy with friends or family. I find everyone loves to customize their own serving with various toppings, and you can find many ideas below. In a large skillet set to medium high, add ground beef. Cook until no longer pink, stirring occasionally, about 4-5 minutes. Add to slow cooker with remaining ingredients. Cover and cook until chili thickens, about 8 hours on low or 6 hours on high. Serve with desired toppings. This is a recipe created for McCormick. I was compensated for my time, but all opinions are my own. 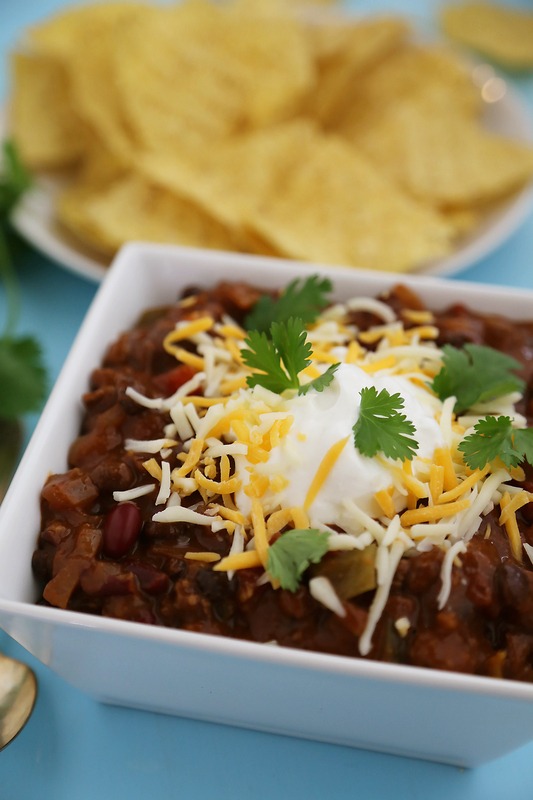 I could eat chili every night during fall and winter– there are so many ways to enjoy it! You should not use over the counter tooth whitening treatment options if you have problems for example chewing gum illness, dental cavities or tooth decay. These lightening therapies have some very strong substances which could result in a great deal of pain and damage if you utilize them around broken the teeth or if perhaps they are available in happy with diseased gum line. If you suffer from tinnitus work to relieve any nasal congestion you could have. The stress from blockage can boost your ringing in ears signs. Try out getting to sleep together with your head increased and for those who have allergic reactions handle them the ideal that you can. Keeping a cozy air humidifier will also help to open up the blockage, which can relieve your tinnitus signs. If you are having trouble visiting a game while you are actively playing it, attempt changing the illumination setting. This ought to make your monitor look sharp, enhancing your video games encounter. And let’s face it, you will not obtain just about any accomplishment should you can’t see what you are actually performing, so make your game do the job.